Cereus nesioticus K.Schum. ex B.L.Rob. Proc. Amer. Acad. Arts xxxviii. 179. Distibution: Galapagos Islands, Ecuador. Origin and Habitat: Bartolome (Bartholomew), Fernandina (Narborough), Genovesa (Tower), Isabela (Albemarle), Pinta (Abingdon), and San Salvador (James or Santiago) Islands in the Galapagos archipelago. The Fernandina island has had no plants or wildlife introduced by man and is one of the very rare natural environments left on the planet. Habitat: It grows exclusively in xeric zones on nearly barren lava fields, lying at sea level where it makes wide-spreading clusters. Lodging in crevices on the soil-less rock. It creates its own humus from dead cylindrical stems. Not only is it one of the few plants that survive in this extremely dry, challenging habitat, it is also a typical 'pioneer' plant, one of the first plants to colonise a fresh barren lava flow. Description: It is a slow-growing, relatively short columnar cactus, densely clumping from the base, densely covered with soft furry spines and grows in clumps to a height of about two 60 cm and up to 2 m wide. New growth is yellow, turning to brown or black, which darkens to gray with age. Spines: 40 or more , 2.5 cm long, unequal, yellowish when young, darkening to brown or black as they ages, radiating, stiff to somewhat flexible, 0.5-5 cm long. Flowers: Diurnal, narrow funnelform, creamy white from the side of the stems, 6-10 cm long, 2,5-5 cm in diameter. Floral tube with numerous spiny areoles and small scales. The flowers are visible in the early morning hours only opening just before dawn, and normally fade by 7 or 8 in the morning. Fruits: Tan-coloured, fleshy at maturity, 1.5-3.5 cm long, 1-1.4 cm in diameter, covered with yellow spines. Flowers remnants persistent. Seeds: Brownish-black, rounded to ellipsoidal, 1-1.5 mm long. Remarks: Brachycereus nesioticus (K. Schum.) Backbg. is most closely related to the Andean (Ecuador) Armatocereus cartwrightianus (Britt. & Rose) Backb. Notes: The government of Ecuador prohibits the collection of any plant in the Gal?pagos, which have been designated a national park. 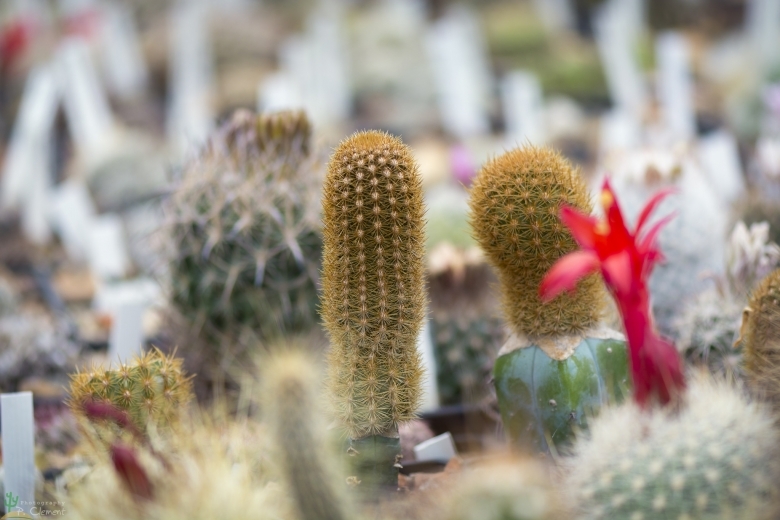 The Brachycereus nesioticus is almost unknown in cultivation for it is not only difficult to obtain seeds or plants, but practically the only success in propagation has been by grafting. Cultivation and Propagation: This plant can take a good deal of water during active growth, and should be watered only when not dormant. Keep dryish in winter. This plant should be over-wintered in the greenhouse at temperatures over 12°C (avoid letting temperatures drop lower than 5° C). Use a very draining but rich soil, and not too much sun.